Bulk orders (10 or more) are $15 dollars per copy instead of the $25 on Amazon. Please contact Wendy at wendyv.dbc@gmail.com. She will guide you through the process and get you the best price possible. Passing "the test" is only one part of this story. When Andrew Sharos began teaching Advanced Placement US History (APUSH), the school's track record on AP exams left something to be desired. The school scores averaged a 2.7 out of 5, and only 18 percent of the APUSH students passed the exam the year before. In his first year of teaching APUSH, 92 percent of his students passed the exam. And in years that followed, 100 percent of his APUSH students passed the exam. With a national average near 50 percent on the APUSH exam, the fact that every student in Sharos's class passed is pretty incredible. But there is more to this story: The odds are stacked against the students in his suburban-Chicago school. Financial hardship, full-time jobs, and hunger are a "normal" part of life for many of his students. Despite the daily challenges they face, these students are learning they can beat the odds. It's a heartwarming, unlikely success story proving that, with the proper support, every student can experience academic success. 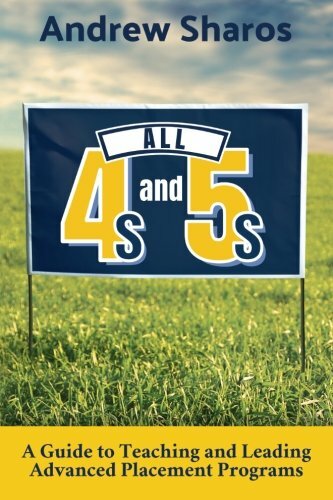 All 4s and 5s is a practical guide to teaching AP courses and leading AP programs. With twenty-five classroom strategies and twenty-five program strategies, All 4s and 5s equips you to develop a culture of academic and personal success. "Sharos takes us behind the curtain of the Advanced Placement exam and, in doing so, outlines some impactful strategies to maximize scores and learning. All Advanced Placement teachers will find a kindred spirit in the wisdom and stories Sharos provides throughout the book. This book is filled with hope, and it showcases how the intensity of AP learning is filled with relationships and life lessons that last much longer than the knowledge gained in the classroom." "I appreciate the emphasis on relationships throughout the book. It includes tons of logical and practical pieces of advice, but it always comes back to the kids and their experiences. The influence of Sharos's own experiences as an AP student and his connections with other educators contribute to building a really authentic read." "It should come as no surprise that this book moves beyond tips and tricks of student AP scores and gets at the very heart of what all our kids need: human support. Sharos beautifully outlines realistic strategies and the relationship needs that cannot be ignored in any AP classroom. You will find the softer side of Sharos's experience in the student success stories woven throughout this book of actionable AP advice. You'll see the connections and opportunities released when we believe in students and come to understand the reality that, without unwavering expectations, we do our students a great disservice." "This is the AP book I have been waiting for! From the first chapter to the end, it is full of practical, applicable, and creative strategies. It does not contain complex theory, complicated data, pretense, or a one-size-fits-all approach to teaching. Sharos explains the idea that class culture matters, as does the us-against-the-test approach, which helps students succeed academically while adding value to each student and what they can contribute for the greater good. Another idea he shares--that hard work can be fun--is long overdue in the complexity of education today. Finally, it's a book that promotes building relationships as the key to student success. Thank you, Andrew, for your commitment to promoting hope!" "'If you want to learn how to teach, then just teach.' Sage words of advice handed on from one generation of teachers to another. Here it is again, shared for a new era by Andrew Sharos. Straight from the shoulder, devoid of annoying academic jargon, searingly honest about failures and successes--Sharos gives us more than he imagines. Student outcomes are about students--not outcomes. Student success comes from discipline and interaction with a caring and demanding teacher. Student success can be pivotal and life changing. This is a good book. Heed its common-sense advice." "Educators always look for inspiration and something to rejuvenate their spirit. Sharos's book provides practical best practices that can be implemented immediately in our AP classes. And his heartwarming stories of being one team in the AP classroom encourage me to remind my students we are in this game together. We will succeed!"